Being a network marketer comes with basic obstacles and issues, that all of us have to deal with. Those obstacles are network marketing objections. We hear objections often when we are new, and never fully get away from them no matter how experienced we become. But, one thing we do, is learn to overcome network marketing objections. So in today’s post, I am sharing with you how I personally overcome the network marketing objection of “I wouldn’t be good at this” and even turn a few of those objections into new team members. I always explain this when I teach on handling network marketing objections. The reason is, it helps you to learn more on overcoming the objections. Since there are several ways a person can object to your business, it’s important to know the reason. For many people, it is because they do not see the value in your business. This is why as you become more experienced you hear less network marketing objections. But for some, they do have legit concerns and possibly caught wind of network marketing through an unexperienced person. So when you feel a person really does have an interest in your business, and the objection is simply a stumbling block, you can usually overcome the objection and move on. If you feel as they are just not seeing the value, or are the type of person to always be looking for something wrong with everything, just let them go. You must decide this, and be sure to never try and signup everyone. A good network marketer does not want to get everyone on their team, simply the right people instead. This is most likely the most fun network marketing objection to overcome. When someone says to you “I wouldn’t be good at this” the best way to overcome this objection, is to agree with them. Say to them “Yea, you probably wouldn’t be” and take note of the reaction you’ll get from the prospect. If a person is just thinking out loud, and does not have the mindset yet to understand success, then agreeing with them will get a large amount of those people to really consider what they just said. Since there are several ways people can reply back, there is not a way for me to script out how to respond after agreeing with them. But what you will find, is a few of these objections will be turned around into signups. Many will want to prove you wrong, many will regret saying it, and many will change their thinking when you mention it takes hard work to succeed. There will always be the ones who this does not work on, so don’t get upset. Remember when people are using network marketing objections, they are usually trying to get out of joining. So any turn around on handling network marketing objections, is a plus. Many people think less of themselves, in all areas. There are many people who simply don’t believe they can do much of anything. When you get this response, there is a chance it is a person who thinks this way. Sometimes they are wanting to hear “No, you’d be wonderful at this, your awesome” so when you agree with them that they would be no good at this, it stuns them. No one can succeed in network marketing or any business with a mind such as this. So using this network marketing objection handling trick, you can achieve the goal intended for the prospect. Which is get rid of them, help them realize their thinking stinks, or fire them up for the challenge. Understanding why people say the particular objection they do, helps you to overcome the objection and handle it in the right way. If this helps you to understand how to handle network marketing objections better, please leave a comment below. 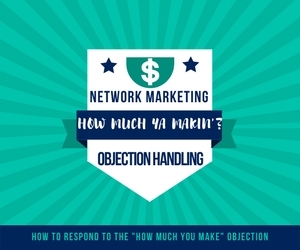 Also, if you have team members who struggle with network marketing objection handling, then share this with them so they can learn to overcome network marketing objections. Be sure to also leave me any comments on how you have handled this network marketing objection, so readers can get even more value and ideas from this. P.S If you’d like to get involved with a huge “green” rush, then take this free tour below and lock in a spot with me. I will build you a customer and affiliate base that will also help pay you, if you like what you’ll see from it!